DH and I took Little Man out for pizza a little while ago. I hadn’t been out of bed in a long time and I was feeling up to getting some fresh air. Also, I’m not gonna lie, the lure of Pinkberry right across the street from the pizza place gave me the extra push I needed to change my shirt and underwear. Do not leave the house without your gloves and mask, Mom would always say. With her voice buzzing in my ear, I donned a hat to cover my bald head, blue rubber gloves, and I tucked a mask into my pocket just in case I was in a confined space with strangers who were carrying enemy bacteria that could unhinge my fragile, no non-existent, immune system. And, we were off! Dinner went well. Little Man was on his bestest behavior charming all those that passed by our table. He happily colored with crayons and gnawed on a chunk of bread while we waited for our pizza. The biggest decision that night was whether to have spinach, garlic, mushrooms, or some combination of those on our pizza. It felt so good to debate pizza toppings instead of pharmaceutical drugs. For the first time in months, DH and I sat across from each, stared into each eyes and talked about work, life, finding a job, moving, friends, and all sorts of other things you talk about with your best friend. Cancer wasn’t a part of conversation that night. 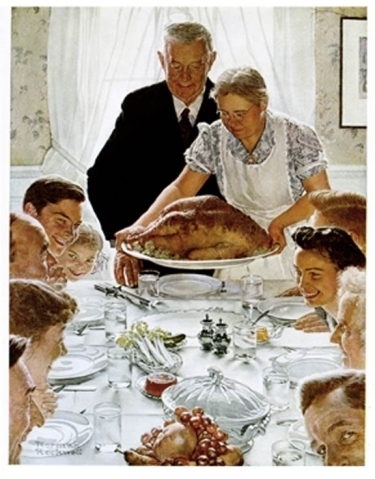 In fact, it had no place in this Norman Rockwell picture we were busily painting. After dinner, we stood at the street corner and waited for cars to pass. As soon as the coast was clear, we each took of one Little Man’s little hands and cheerfully hurried him across the street. This is really nice, DH said. It feels normal. For a moment I felt the same thing, that normalcy that DH was referring to. But then instantly “cancer” slapped me and it felt like whip lash. Normal? What is normal about this? Your wife has cancer. I look like an alien. We are suddenly living with my parents at the age of 32 and having been married for five years. I have been in bed for four months. I go to the hospital every third week for seven nights…and on and on my mind raced counting all the things that render us so far from our normal. I don’t know what normal is anymore. DH and I had been building our normal since the day we met in 2001. We chose our building materials carefully, fretting over every detail. We debated and negotiated passionately and came to an agreement on how our life would look. Modern or contemporary? Marble or glass? East coast or west coast? But then, cancer burned all of our blueprints and now we must start again. Letting go of our old normal to make room for the new normal is frightening. I don’t know what our new normal looks like or what it feels like. I’m not even sure we know what we want it to look like. But in that moment in time, in the cool breeze, stuffed with saucey-cheesy-bread, two people who love each other and their little boy…yeah, it did feel normal.